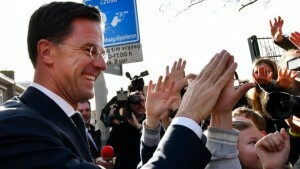 THE HAGUE - Dutch Prime Minister Mark Rutte's party has won the most seats in parliamentary elections, exit polls say. Early results confirmed the exit polls, with his centre-right VVD Party on course for 31 out of 150 seats. Three parties are projected to win 19 seats each: Geert Wilders' anti-immigration Freedom Party (PVV), the Christian Democrats and the D66 party. Mr Wilders' party had been leading in opinion polls but support for the party appeared to slip in recent days. With 10.9% of votes counted early on Thursday, the VVD had polled 17.8%. Voter participation in the general election was high; the 81% turnout was the highest for 30 years. Analysts say a high turnout may have benefited pro-EU and liberal parties. "Today was a celebration of democracy," Mr Rutte said, adding that the Netherlands had said no to the "wrong kind of populism". Although the VVD had lost several seats since the last election, many had expected the party to lose much more ground to the Freedom Party. Many had been watching the vote in the Netherlands closely, as an indication for how populist parties may fare in other elections in EU countries. France goes to the polls next month to elect a new president, while Germany is due to hold a general election in September. German Chancellor Angela Merkel has called Mr Rutte to congratulate him, while Luxembourg Prime Minister Xavier Bettel has also tweeted his congratulations.